As architectural restoration and conservation has progressed on the fabric of the building, our attention has recently turned to the fine collection of altar frontals and other embroidery preserved in the church. Not long after the completion of the building, the vicar, Rev. Richard Travers Smith, must have turned his attention to procuring a set of suitably rich embroidered frontals for use in the sanctuary during the different seasons of the church calendar. The traditional colours in the Anglican church are green for ordinary times; red for Palm Sunday, Pentecost, and the feast days of martyrs, apostles, and the evangelists; purple for Good Friday as well as during Advent and Lent; and white or gold for Christmastide, the Easter season, and for weddings. One of the oldest and, from the point of view of the embroidery, the richest of our altar frontals is the purple frontal, which has a separate pelmet that runs along the top of the altar. 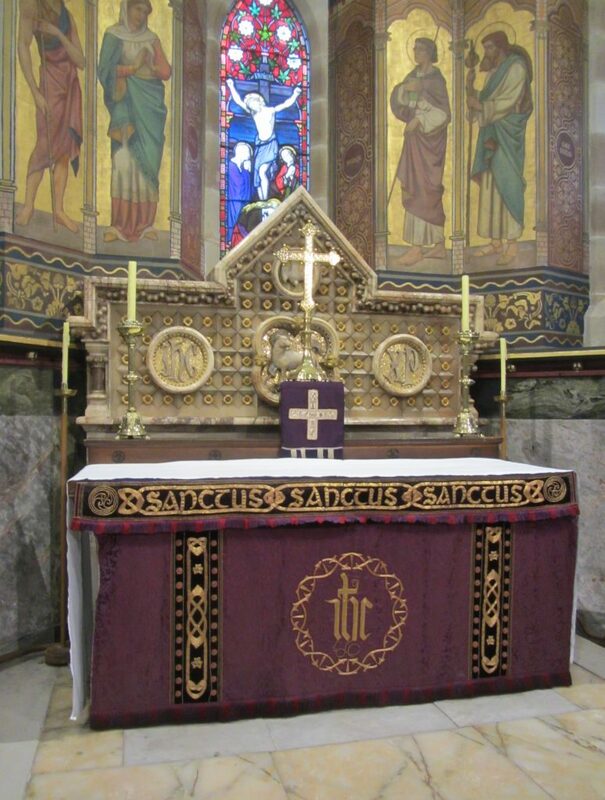 Perhaps because it was one of the most elaborate and oldest embroideries, the pelmet of the purple altar furnishing was quite the most worn in the church. 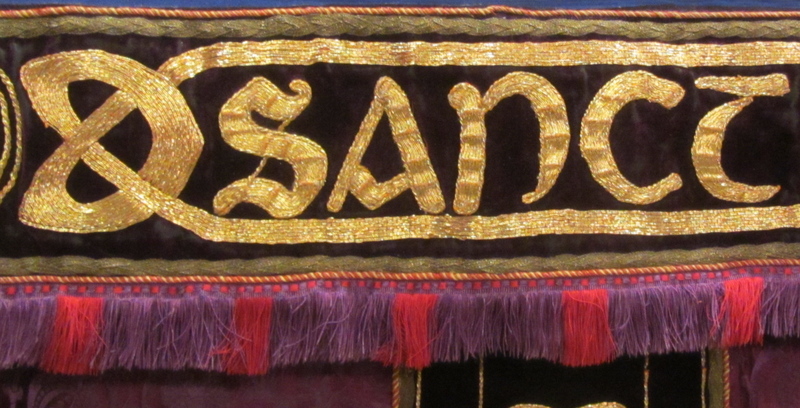 The pelmet, a detail of which appears here, carries the inscription SANCTUS SANCTUS SANCTUS, embroidered on a backing of black velvet and contained between two sewn ribbons of gold thread with an outer plaited border of silver-grey threads and then a twisted scarlet cord. 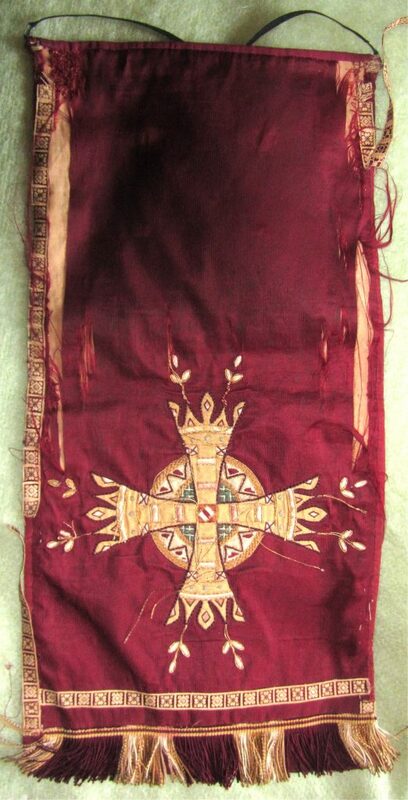 The photograph also shows how the fringe, made of alternating violet and scarlet threads below the pelmet, has been rubbed away by over 120 years of contact with the vestments of clergy officiating at the altar. But the fringe was not the part of the pelmet that had suffered most. The embroidery above had been almost destroyed and had to be completely reconstructed using as much of the old fabric as could be preserved. The altar pelmet makes extensive use of a technique known as ‘couching’ where threads, which are laid side by side to create the appearance of a single band, are stitched down into the background material by tiny, almost invisible stitches. In our pelmet, fourteen gold threads are used to create each band and also to form the face of the letters. 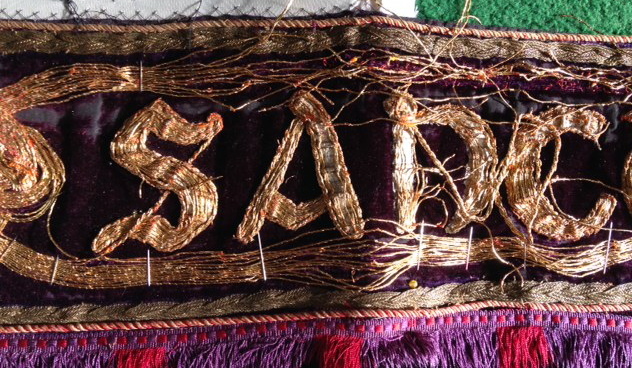 The threads are sewn down in pairs to create a gold sheen on both the border and the letters. 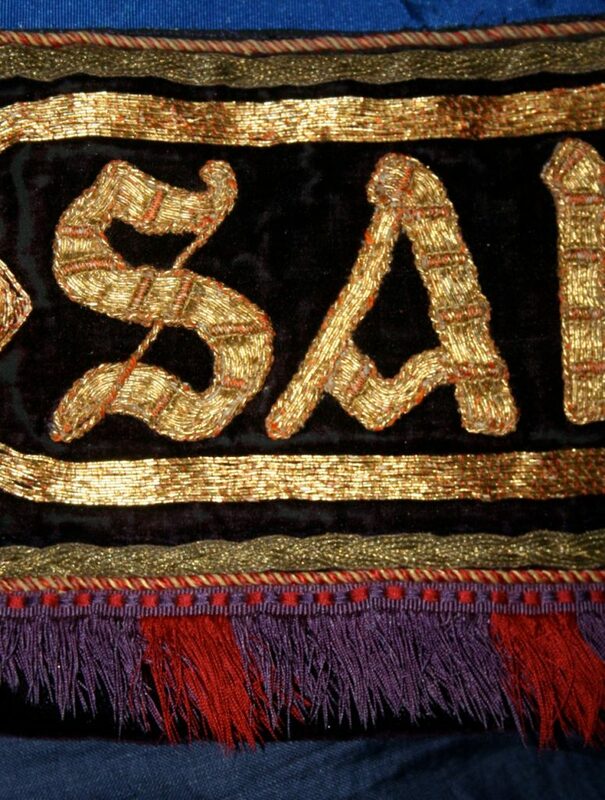 The Victorian embroiders also made use of an additional resource to enrich the face of the letters so that the surface of the words SANCTUS SANCTUS SANCTUS is given a ribbed effect, which catches the light and glitters when the pelmet is stretched across the top of the frontal. In the course of remaking the pelmet it became clear how elaborate and intricate the construction of the inscription had been. Five stages were involved: (1) the letters were drawn out on a piece of white linen; (2) short orange cords were then stitched across the face of the letters, with either four or five cords according to the parts of the individual letters; (3) the gold threads were then ‘couched’ along the surface of the letters, rising and falling as they passed over each of the orange cords; (4) each embroidered letter was then cut from the linen background to be stitched in place on the velvet front of the pelmet and, finally, (5) a twisted gold thread was applied as a border around each letter to add definition and visual variety, as well as to mask any trace of the white linen. In creating the altar pelmet this process had to be repeated twenty-one times before the inscription was complete. The state of the pelmet in August 2017, before restoration of the embroidery, shows how badly every section had been damaged. The letters were loose and had lost much of the twisted gold thread that once surrounded them; the plaited silver gold border was worn and missing in places and—worst of all—practically all the gold threads of the ‘ribbon’ that surrounded the inscription had worked loose and many were missing. In places the altar pelmet almost resembled a haystack! In the second illustration the structure of the embroidery is very clear and a start has been made to count and pin back the gold threads. Work of this character is highly technical and involved the choice and replacement of many meters of ‘Japan’ thread, which is a core of orange silk around which ribbons of gold are twisted. On the pelmet the orange core could be seen clearly, showing through in areas where the gold had been worn away. New Japan thread was provided by Burton & Jones of London, a long-established company that holds the royal warrant for embroidery materials. Unfortunately, Japan thread on a silk core is no longer manufactured. A retired worker in the company, Mr. Bill Barnes, was able to find some on a polyester yellow core so that, when that begins to wear through, people with sharp eyes may notice a difference in colour. Two thicknesses of thread had been employed on our pelmet: size 13 for the borders and a finer size 9 for the face of the letters—Victorian craftsmanship at its very best! The work of reconstructing the pelmet has been undertaken by Harriet Crawford. 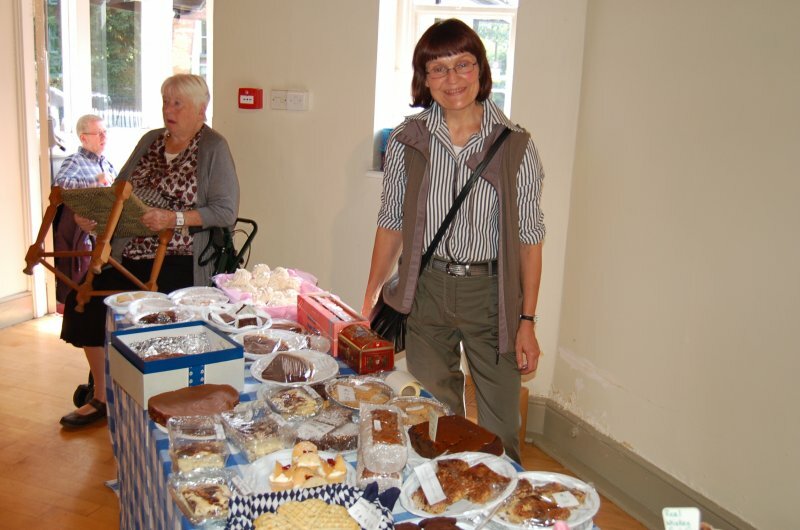 As a teenager in the 1990s, Harriet acted as a server in Saint Bartholomew’s for several years under the eye of then vicar Rev. John McKay. 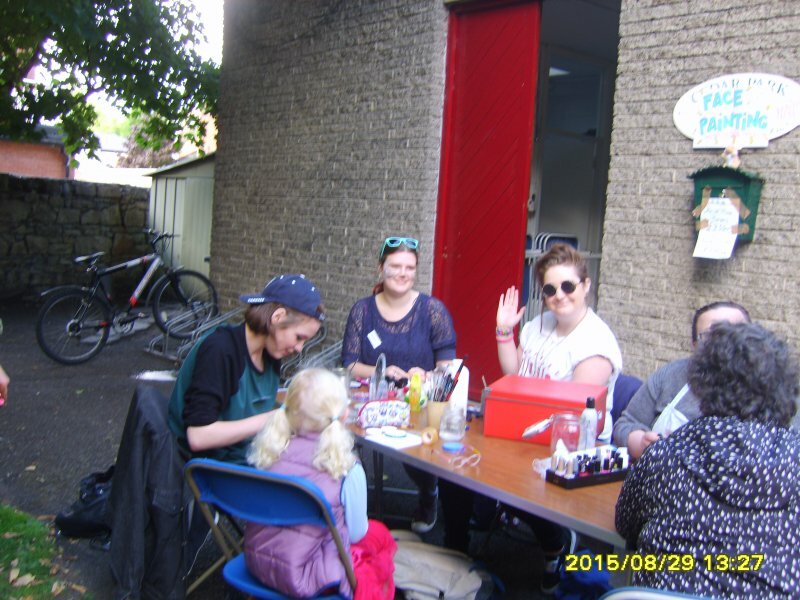 She now lives in Edinburgh and has been following courses organised by the Royal College of Needlework at the Scottish National Portrait Gallery. It took her no less than 340 hours to repair the purple pelmet, which she finished just after the first Sunday in Advent 2017. It was reinstated upon the altar and looked splendid for the rest of Advent. Now stored in a cupboard with the other frontals, the purple pelmet will reappear during Lent from Ash Wednesday, 14 February, through Saturday, 31 March. For the meantime, Harriet, who greatly enjoyed the challenge of the pelmet, is planning to repair the church’s red pulpit fall: here the background damask has to be replaced and there is more complicated embroidery to restore.